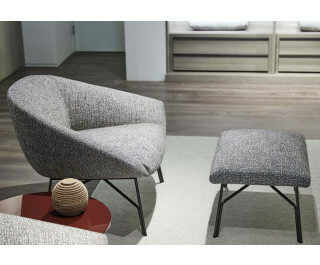 Retrò creations with modern balance for Lennox lounge chair by Gordon Guillaumier. This refined design is inspired to an open corolla, suspended into the void, on the light structure in metal in bronze colour, which turns into an idea for an elegant and discreet armchair for conversations. A private, soft and seductive nest for reading and listening to fine music. A detail that also inspired the name. The daybed is equipped with a padded foot-rest pouf with light structure in bronze metal.